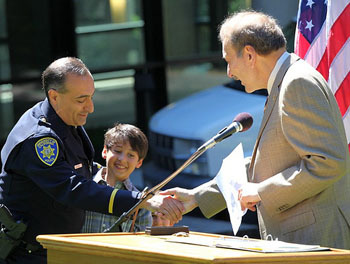 Police Chief Nader Oweis joins UCSC after serving 17 years as a sworn officer at UC Davis, where he received the UCD Police Department's Distinguished Service Medal, as well as the campus's Calvin E. Handy Leadership Award. Dozens of family members and friends attended the swearing-in ceremony on Tuesday in front of McHenry Library on campus. Here, Oweis holds up his hand while taking the oath of office, while three children hold up their hands in support. From left to right, they are Alex Orfali, nephew; John Orfali, nephew; and Alex Dabbagh, son of a friend. Chancellor George Blumenthal administered the oath of office and congratulated Oweis. 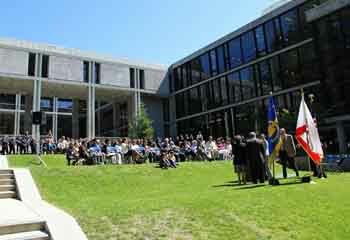 The ceremony drew more than 100 well-wishers, including law enforcement from the UCSC campus, UC Davis, and throughout Santa Cruz County. It takes a lot to make Nader Oweis mad. Part of it is his natural temperament. Part of it is his 20 years with the UC Davis Police Department – both as a student employee and a sworn police officer. Part of it is his ability to see police work from a dual perspective. Oweis, a native of Daly City, may be a cop, but he also understands what it means to be stereotyped and profiled. A Palestinian-American, he has been detained at an Israeli airport when trying to enter the country to visit relatives. "In my life, I’ve learned a lot about earning respect, and what values and principles are important to me," said Oweis, 41. (His first name rhymes with “madder,” while his last name is pronounced "oh-wayce.") 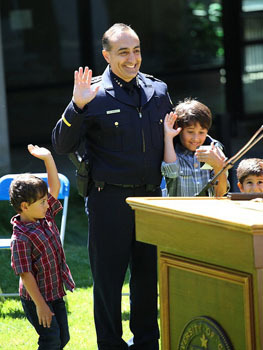 He was sworn in Tuesday as UC Santa Cruz’s newest police chief. He replaces Mickey Aluffi, who retired in the spring. Oweis will be part of a department that includes 40 employees, including 17 sworn officers. More than 30 former colleagues, many of them wearing police badges, made the 111-mile trip from Davis to attend the ceremony. Dozens of relatives also attended, including his father, Sami, and his mother, Nawal, who pinned the badge on her son, and showed up at the ceremony with two huge platters of baklava she made for the occasion, with help from a neighbor. When Chancellor George Blumenthal asked Oweis to hold up his right hand to take his oath of office, two nephews joined in, each holding up a hand as they stood beside him. At one point during the ceremony, Oweis looked straight at his parents and said, "Yes, I did … I got a real job." Oweis, a lifelong California resident, is unmarried but maintains strong ties with his wider family in the East Bay. He may seem young to have two decades of police experience behind him. But when Oweis was still a sophomore at UC Davis, he did something that might sound like a one-way ticket to terminal uncoolness for any undergraduate: he started helping out the campus police any way he could. He joined the Police Department’s Aggie Host Security Program, which helped with security at community events. Oweis learned how to handle public safety at on-campus football games. He had to deal with public intoxication, shoving matches, rowdiness, and all the other issues that can arise when 100,000 people congregate. He graduated from UC Davis with a dual degree in agriculture and management economics in 1992, and returned to campus two years later, this time as a sworn police officer. He stayed for 17 years. One could argue that his history with the police goes back even further than his college days. He was a little boy, helping out his parents at their grocery store, Westlake Avenue Market in Daly City, when he first became enamored with law enforcement work. "He’s wanted this since he was this big," his mother said on Tuesday, holding her hand close to the ground. Police officers frequented his parents' store, and sometimes they put the three-year-old Oweis in their patrol cars, just to let him turn on the lights and even turn on the siren. "I always thought it was fascinating," he said. Perhaps his interest in law enforcement was something innate, he muses now. He also wonders if his calmness on the job is another inherited trait. "I have always had a lot of patience,” Oweis said. "I don’t know if that is my genes or something that I learned. Everyone says I am even-keeled, but I spent a lot of time growing up in a mom-and-pop grocery store. Customer service is important." "To win people over, you have to be calm," he continued. "If you come across as a jerk, or in a manner that is too strong, you may not earn their respect. For a while, I was a hostage negotiator for the department. I learned that people don’t work well when they are hot and yelling at each other." He learned the importance of diplomacy while serving as the lieutenant and commanding officer of the UC Davis substation that oversees public safety for the university’s Health Systems Campus in Sacramento, including a trauma center. Oweis cites another factor when describing his value of equanimity. 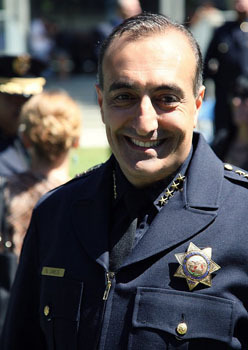 He values his heritage and maintains strong ties with the Arab-American community of Northern California. Like many Palestinian-Americans, he is Christian, and maintains a connection to his community through the American Federation of Ramallah Palestine, the National Association of Arab Professionals, and other cultural groups. "I am involved culturally and professionally with both groups and made a lot of great friends from that, but, at the same time, I have to be fair with everybody and have to make sure that those stereotypes that I hear, and that I see, don’t affect the way I do my job." "In some sense, it makes me even more fair because I have another perspective. Culture is important to me because I learned a lot about earning respect, and what values and principles are important to me." When pressed to elaborate, Oweis cited a few recent and more distant memories. "After 9/11, I was taken out of line at airports many times," he said. He believes that his Arabic name and his appearance may be a reason. In some cases, he was even carrying his police badge while being searched, though he made a point of not taking it out and showing it to security staff. "I fully understood they were trying to do their job and trying to keep the country safe, looking out for the best interests of everybody," he said. “They did this because they had to, or at least they thought they had to. I went with it. I couldn’t control it. It was going to happen anyway. There was nothing more that I could do except at least be patient." He also described another incident that took place when he was trying to get into Israel and got pulled aside at Ben Gurion International Airport in Tel Aviv, where he was questioned and held for 12 hours. "It happened again when I was crossing over the border two years ago, but what can I do? I had to follow the rules. I have family in Ramallah and Jerusalem. You have to go in the West Bank and into Israel proper – Palestine and Israel. I was not going to let it ruin my vacation. I figured I would, eventually, be able to get through and move on." Oweis often talks about his cultural community—but he also uses community outreach to describe his approach to police work. Oweis plans to spend part of his time making sure that the campus-wide and city-wide communities can help be the "eyes and ears" of public safety. "We can only keep the community safe with the help of this community, and the only way to get their help is to reach out and engage with them," he said. Part of that is his hands-on working style. Oweis sometimes writes up and sends out public safety press releases himself. Oweis is excited about getting started here. Like UCSC, UC Davis is much like a city in its own right, with its own fire and police departments. "I’ve learned a lot in my career that I can apply to my new job,” he said. "I believe I have something valuable to offer Santa Cruz." But he won’t deny the other perks. "Being up in the hills in a beautiful campus will be nice. Getting a look at the beach won’t be a bad thing either. This could be a very good fit for me."